پیرایش, حمیدرضا, آزاد فلاح, محمد, دوست حسینی, کاظم, بلسی, پاولو, یوسفی, حسین. (1394). تاثیر روش‌های مختلف خشک کردن بر نانو الیاف سلولزی و چندسازه‌های حاصل از آن. مجله صنایع چوب و کاغذ ایران, 6(2), 285-298. حمیدرضا پیرایش; محمد آزاد فلاح; کاظم دوست حسینی; پاولو بلسی; حسین یوسفی. "تاثیر روش‌های مختلف خشک کردن بر نانو الیاف سلولزی و چندسازه‌های حاصل از آن". مجله صنایع چوب و کاغذ ایران, 6, 2, 1394, 285-298. پیرایش, حمیدرضا, آزاد فلاح, محمد, دوست حسینی, کاظم, بلسی, پاولو, یوسفی, حسین. (1394). 'تاثیر روش‌های مختلف خشک کردن بر نانو الیاف سلولزی و چندسازه‌های حاصل از آن', مجله صنایع چوب و کاغذ ایران, 6(2), pp. 285-298. پیرایش, حمیدرضا, آزاد فلاح, محمد, دوست حسینی, کاظم, بلسی, پاولو, یوسفی, حسین. تاثیر روش‌های مختلف خشک کردن بر نانو الیاف سلولزی و چندسازه‌های حاصل از آن. مجله صنایع چوب و کاغذ ایران, 1394; 6(2): 285-298. در این تحقیق، تاثیر روش‌های مختلف خشک کردن بر نانو الیاف سلولزی و چندسازه‌های حاصل از آن بررسی شد. چهار روش برای خشک کردن سوسپانسیون نانو الیاف سلولز مورد استفاده قرار گرفت؛ روش هوای آزاد، خشک‌کن کوره‌ای، خشک‌کن پاششی و خشک‌کن انجمادی. ریخت‌شناسی و اندازه ذرات با استفاده از روش‌های تفرق نور لیزر (DLS)، آنالیز اندازه ذرات و میکروسکوپ الکترونی روبشی (SEM) مورد بررسی قرار گرفت. همچنین خواص مکانیکی فیلم‌های تقویت شده با این پودرها مطالعه گردید. از بین روش‌های مورد مطالعه فقط ذرات تهیه شده به روش پاششی در محدوده مقیاس نانو بوده و قابلیت ارتقاء چشم‌گیر خواص مکانیکی فیلم‌های برپایه پلی لاکتیک اسید (PLA) را دارا بودند. Beecher, J.F., 2007. Organic materials: wood, trees and nanotechnology. Nature Nanotechnology, 2:466–467. Hubbe, M.A., Rojas, O.J., Lucia, L.A. and Sain, M., 2008. Cellulosic nanocomposites: a review. BioResources, 3(3):929–980. Siro, I. and Plackett, D., 2010. Microfibrillated cellulose and new nanocomposite materials: a review. Cellulose, 17:459–494. Siqueira, G., Bras, J. and Dufresne, A., 2010. Cellulosic bionanocomposites: a review of preparation, properties and applications. Polymers, 2:728–765. Habibi, Y., Lucia, L.A. and Rojas, O.J., 2010. Cellulose nanocrystals: chemistry, self-assembly, and applications. Chemical Reviews, 110:3479–3500. Eichhorn, S.J., Dufresne, A., Aranguren, M., Marcovich, N.E., Capadona, J.R., Rowan, S.J., Weder, C., Thielemans, W., Roman, M., Renneckar, S., Gindl, W., Veigel, S., Keckes, J., Yano, H., Abe, K., Nogi, M., Nakagaito, A.N., Mangalam, A., Simonsen, J., Benight, A.S., Bismarck, A., Berglund, L.A. and Peijs, T., 2010. Review: current international research into cellulose nanofibres and nanocomposites. Journal of Materials Science, 45:1–33. Klemm, D., Kramer, F., Moritz, S., Lindstrom, T., Ankerfors, M., Gray, D. and Dorris, A., 2011. Nanocelluloses: a new family of naturebased materials. Angewandte Chemie International Edition, 50:5438–5466. Moon, R.J., Marini, A., Nairn, J., Simonsen, J. and Youngblood, J., 2011. Cellulose nanomaterials review: structure, properties and nanocomposites. Chemical Society Reviews, 40:3941–3994. Peng, Y., Gardner, D.J. and Han, Y., 2012. Drying cellulose nanofibrils: in search of a suitable method. Cellulose, 19(1): 91-102. Virozub, A., Haimovich, N. and Brandon, S., 2009. Three dimensional simulations of liquid bridges between two cylinders: Forces, Energies and Torques. Langmuir, 25:12836-12842. Ferguson, W., 2012. Why wood pulp is world's new wonder material. New Scientist, 2878:24. Lavoine, N., Desloges, I., Dufresne, A. and Bras, J., 2012. Microfibrillated cellulose—Its barrier properties and applications in cellulosic materials: A review. Carbohydrate Polymers, 90: 735–764. Azeredo, H.M.C., 2009. Nanocomposites for food packaging applications. Food Research International, 42: 1240–1253. Fernandez, A., Cava, D., Ocio, M. J. and Lagaron, J. M., 2008. Perspectives for biocatalysts in food packaging. Trends in Food Science & Technology, 19(4): 198–206. Goring, D.A.I., 1963. Thermal softening of lignin, hemicelluloses and cellulose. Pulp Paper Magazine Can, 64(12):T517–T527. Gardner, D.J., Oporto, G.S., Mills, R. and Samir, M.A.S.A., 2008. Adhesion and surface issues in cellulose and nanocellulose. Journal of Adhesion Science and Technology, 22:545–567. Nakamura, K., Hatakeyma, T. and Hatakeyma, H., 1981. Studies on bound water of cellulose by differential scanning calorimetry. Journal of the Textile Institute, 72(9):607–613. Weise, U., Maloney, T. and Paulapuro, H., 1996. Quantification of water in different states of interaction with wood pulp fibres. Cellulose, 3:189–202. Peng, Y., Gardner, D.J., Han, Y., Kiziltas, A., Cai, Z. and Tshabalala, M.A., 2013. Influence of drying method on the material properties of nanocellulose I: thermostability and crystallinity. Cellulose, 20(5): 2379-2392. Nandiyanto, A.B.D. and Okuyama, K., 2011. Progress in developing spray-drying methods for the production of controlled morphology particles: From the nanometer to submicrometer size ranges. Advanced Powder Technology, 22:1-19. Masters, K., 1985. Spray Drying handbook, fourth ed., Longman Scientific & Technical, London, U.K., 696 p.
 Quinn, J.J., 1965. The economics of spray drying. Industrial and Engineering Chemistry, 57:35–37. 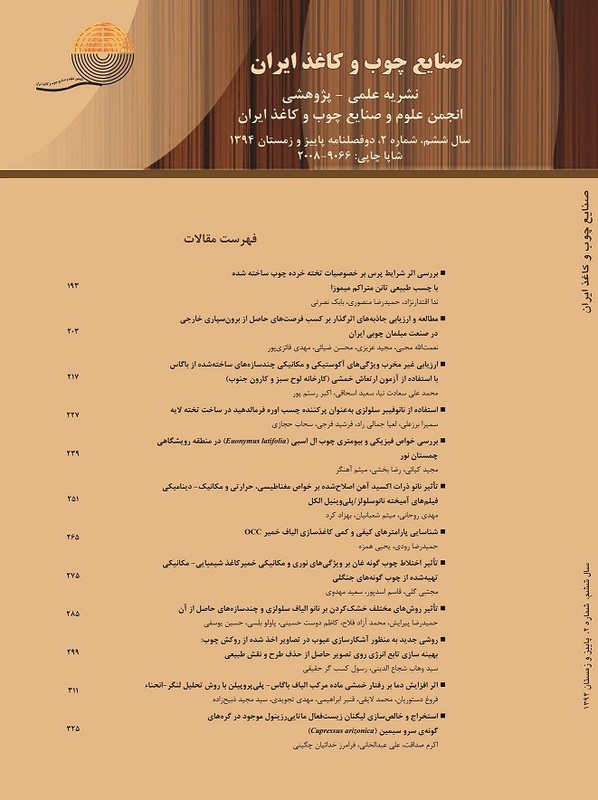 Almasi, H., Ghanbarzadeh, B., Dehghannia, J., Entezami, A.A. and Khosrowshahi Asl, A., 2012. Studying the effect of modified cellulose nanofibers on the functional properties of poly (lactic acid) based biodegradable packaging. Research Institute of Food Science and Technology, 2(3): 205-218. ( In Persian). Mie, G., 1908. Beitrage zur optic truber medien, speziell kolloidaler metallosungen. Annalen der Physik, 4:377–445. Pei, A., Zhou, Q. and Berglund, L.A., 2010. Functionalized cellulose nanocrystals as biobased nucleation agents in poly (L-lactide) (PLLA)–Crystallization and mechanical property effects. Composites Science and Technology, 70: 815–821. Petersson, L. and Oksman, K., 2006. Biopolymer based nanocomposites: Comparing layered silicates and microcrystalline cellulose as nanoreinforcement. Composites Science and Technology, 66: 2187–2196. Cheng, Q., Wang, S. and Rials, T.G., 2009. Poly (vinyl alcohol) nanocomposites reinforced with cellulose fibrils isolated by high intensity ultrasonication. Composites: Part A, 40: 218–224. Pelton, R., 1993. A model of the external surface of wood pulp fibers. Nordic Pulp & Paper Research Journal, 8(1):113–119. Nishiyama, Y., Sugiyama, J., Chanzy, H. and Langan, P., 2003. Crystal structure and hydrogen bonding system in cellulose I alpha from synchrotron X-ray and neutron fiber diffraction. Journal of the American Chemical Society, 125:14300–14306. Jarvis, M., 2003. Cellulose stacks up. Nature, 426:611–612. Klemm, D., Philipp, B., Heinze, T., Heinze, U. and Wagenknecht, W., 1998. Comprehensive cellulose chemistry. Volume 1, fundamentals and analytical methods. Wiley-VCH, New York. 282 p.
 Yildiz, S. and Gumuskaya, E., 2007. The effects of thermal modification on crystalline structure of cellulose in soft and hardwood. Building Environonment, 42: 62–67. Hatakeyama, H., 1981. Structural change of amorphous cellulose by water- and heat-treatment. Die Makromolekulare Chemie, 182: 1655–1668. Tanaka, F.and Fukui, N., 2004. The behavior of cellulose molecules in aqueous environments. Cellulose, 11:33–38. Pakowski, Z., 2007. Modern methods of drying nanomaterials. Transport in Porous Media, 66:19–27. Desobry, S.A., Netto, F.M. and Labuza, T.P., 1997. Comparison of spray-drying, drum-drying and freeze-drying for b-Carotene encapsulation and preservation. Journal of Food Science, 62: 1158–1162. Filkova, I., Huang, L.X. and Mujumdar, A.S., 2007. Industrial spray drying systems. In: Hankbook of industrial drying, 3rd ed. CRC Press, New York, pp 215–254. Kowalczyk, M., Piorkowska, E., Kulpinski, P. and Pracella, M., 2011. Mechanical and thermal properties of PLA composites with cellulose nanofibers and standard size fibers. Composites: Part A, 42: 1509-1514. Iwatake, A., Nogi, M. and Yano, H., 2008. Cellulose nanofiber-reinforced polylactic acid. Composites Science and Technology, 68: 2103-2106. Raquez, J.M., Murena, Y., Goffin, A.L., Habibi, Y., Ruelle, B., DeBuyl, F. and Dubois, P., 2012. Surface modification of cellulose nanowhiskers and their use as nanoreinforcers into polylactide: A sustainably-integrated approach. Composites Science and Technology, 72: 544–549. Habibi, Y. and Dufresne, A., 2008. Highly Filled Bionanocomposites from Functionalized Polysaccharide Nanocrystals. Biomacromolecules, 9: 1974-1980. Yu, T., Ren, J., Li, S., Yuan, H. and Li, Y., 2010. Effect of fiber surface-treatments on the properties of poly (lactic acid)/ramie composites. Composites: Part A, 41: 499-505. Filson, P.B. and Dawson-Andoh, B.E., 2009. Sono-chemical preparation of cellulose nanocrystals from lignocelluloses derived materials. Bioresource Technology, 100: 2259–2264. Das, K., Ray, D., Bandyopadhyay, N.R., Sahoo, S., Mohanty, A.K . and Misra, M., 2011. Physico-mechanical properties of the jute micro/nanofibril reinforced starch/polyvinyl alcohol biocomposite films. Composites Part B: Engineering, 42 (3):376-381. Chen, Y., Liu, C., Chang, P.R., Cao, X. and Anderson. D.P., 2009. Bionanocomposites based on pea starch and cellulose nanowhiskers hydrolyzed from pea hull fibre: effect of hydrolysis time. Carbohydrate Polymers, 76 (4):607-615. Martins, I.M.G., Magina, S.P., Oliveira, L., Freire, C.S.R., Silvestre, A.J.D., Neto, C.P. and Gandini, A., 2009. New biocomposites based on thermoplastic starch and bacterial cellulose. Composites Science and Technology, 69 (13):2163-2168.